Your essential Canon EOS M5 camera field guide in a convenient pocketable style. This EOS Pocketbook is a concise guide to your M5 camera and small enough to carry with you everywhere. Nina Bailey, Technical Editor of EOS magazine and author of the popular EOS eBook series, has the solution. 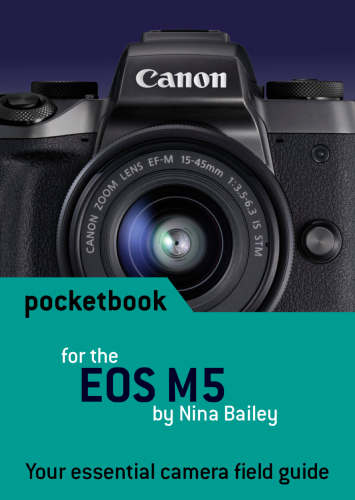 This new Pocketbook for the Canon EOS M5 is a concise guide to the most used and confused features and controls on your camera, based on Nina’s vast experience as lecturer at EOS Training Academy – hearing first-hand what photographers want to know and understand about how their EOS M5 camera operates. Excellent and concise, useful and easy to carry around. Excellent pocket guide, covers the essentials & more. Useful size but very poor value at £10.45 inc P&P. We are sorry to hear that you are not pleased with your pocketbook. If you would like to return the item to us, we will refund you the cost of the book. Good little guide and easy to carry around. Just what I needed for the camera. Good buy. Excellent pocket book clear and concise. Not quite comprehensive enough. H.B. Thank you for your feed back. The pocket guide is meant as a quick reference guide, we are sorry that it was not what you had expected. Why must I enter a comment. Useful reminder to have with you, and in a handy package.